We are incredibly excited about today’s feature, because Lisa He of LHE Bakes creates the most beautiful baked goods! We love how her business has grown since the start, now creating dog treats, custom cookies for clients, and even cookie subscription boxes! She isn’t afraid to try new techniques or experiment, and we think that’s what makes her creations stand out and be so well executed! She’s gotten to where she is through practice and balance — and has some great advice to give through her own creative journey. Keep reading and get ready to seriously crave some cookies! : Tell us a few fun facts about yourself! : Am a software/medical device project manager by trade, but love to use my hands after my “day job” is over. I am slightly obsessed with my dogs. I know I’m going to have dogs for the rest of my life. My husband and I are pretty dedicated to fitness! We eat a “if it fits your macros” lifestyle and lift weights 4x a week– we were feeling really out of shape after getting our first jobs out of college, and realized that it was time for a change so we can live better, longer. We also LOVE doing obstacle races (for fun, not competition). : How did you discover you had a passion for baking and wanted to pursue it to start your own home bakery? : This was a complete accident! One day in college (this was in like 2008) I came across a photo of a French Macaron. They were SO ADORABLE that I became instantly obsessed and spent YEARS trying to perfect them. These beautiful little treats definitely sparked my passion for baking. Over the years, I’ve always maintained some form of creative outlet aside from my day job– because I need a well rounded life to be truly happy. I finally took the plunge last year and started this little gig on the side– haven’t looked back since! Brunch food is one of our favorite things to make and each year one of our friend’s holds a Christmas brunch where we each bring our own dish. This year Cailin made a delicious creme brulee french toast that we just have to share with you guys. If you’ve been keeping up with us or follow us on Instagram, then you already know how much we love doughnuts. I have to take this chance to link back to some of our old posts on Dough, Dun-Well, and Montclair Bread Co. so you can see how our artisanal doughnut hunt has gone so far. When looking up doughnut shops in Austin, I saw that Voodoo Doughnut had opened only two weeks prior in the Sixth Street District. I have been wanting to try their crazy looking doughnuts so this trip was the perfect opportunity! Since it is relatively new, the lines can get a little long but we got there early in the morning and beat the rush. We absolutely love today’s feature with the amazing baker, Vickie Liu. We can’t get enough of her creative, adorable, and often funny cookies amongst other treats! She gives cookies such personality and her Instagram filled with cookie characters and shapes is sure to keep you looking and “wowing” for hours! We talked to her to find out more about how she found her baking talent as well as how she creates epic baked goods and a picture perfect Instagram feed. 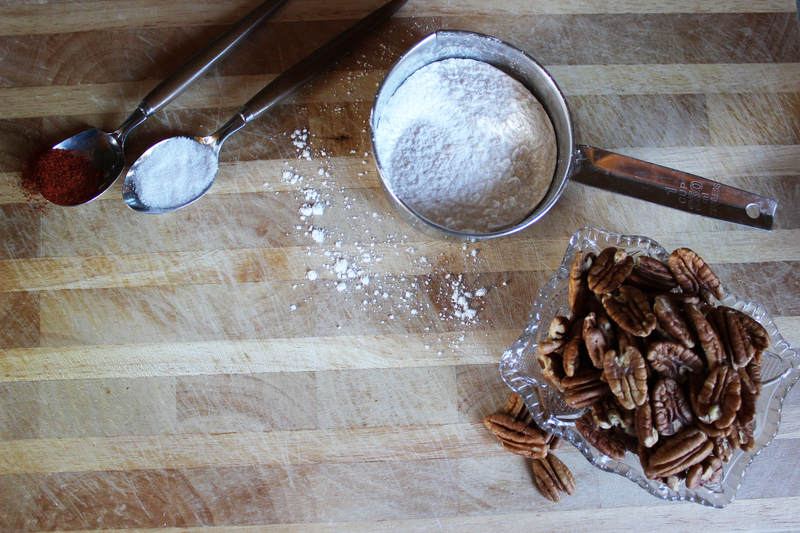 : Tell us a little bit about yourself and how you got your start in baking. : Baking has been an interest of mine since high school, but back then I just made (un-appetizing looking) cupcakes for friends or family when I had the chance! After graduating university from courses I wasn’t passionate about and no full time job – I decided not to do my Masters in Architecture, and instead rekindled my love for baking and have been addicted ever since. I’m currently working a part time job unrelated to my field of study, and baking part time. This includes taking custom orders, working with small businesses and brands, collaborating with other creatives, guest blogging and a little bit of styling. I’m always on the lookout for really simple ways to make salads or yogurt a little different. The other day I had a salad from a restaurant that had these delicious sweet and spicy pecans in them. I searched online for the simplest recipe I could find and found one with just four ingredients on Once Upon A Chef.